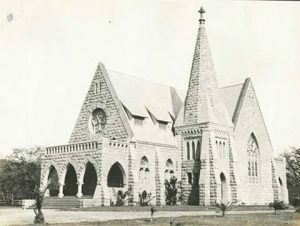 Bishop Memorial Chapel, the official church of the Kamehameha Schools was organized in 1908 and established a relationship with the Hawaii Conference, United Church of Christ. Sabbath services have been officiated on our campus since day one. The office of the Chaplain was established in 1898 and has been a reality since. 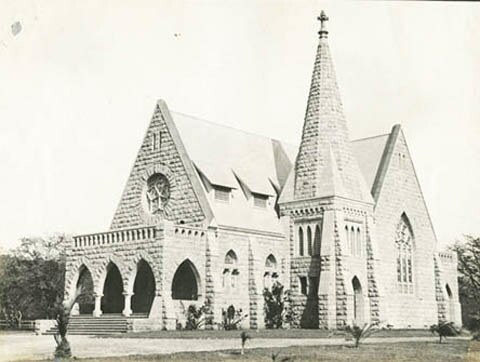 Our first Chapel building was on the grounds of what is known as Farrington High School today. It was near the lobby of the auditorium. 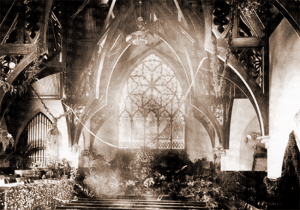 It was built in 1897 by Charles Reed Bishop in honor and memory of his wife, Bernice Pauahi Bishop. December 19, 1897. The chapel dedication took place on the sixty-sixth anniversary of Bernice Pauahi Bishop’s birth. KS scholars, teachers, administrators and community representatives filled the whole building. Ferns, asters and Hawaiian flags decorated the interior. The Reverend H. H. Parker, pastor of Kawaiaha‘o church, preached a sermon based on Matthew 7:24-28. ‘Everyone therefore which heareth these words of mind and doeth them shall be likened unto a wise man which built his house upon the rock.’ The singing of the KS student body and the trained choir directed by Cordelia Clymer was deemed fine by a local newspaper. That evening, a musicale with singing, recitation and responsive reading was held in the chapel at 7:30 p.m. ‘Praise God from Whom All Blessings Flow’ was the theme. September 11, 1938. The Kamehameha ʻohana held its final church service in the Chapel. After four decades of use, the preparatory department buildings and the surrounding land were purchased by the Territory of Hawaiʻi for the Wallace R. Farrington High School. The campus was moved in the 1930’s from the grounds of what we know as Bishop Museum into the hills of Kapālama. We used Keʻelikōlani Auditorium on the campus as our Chapel. In celebration of our 100th year as a school, we built our second Bishop Memorial Chapel to allow us to reaffirm our rich Christian heritage. In other words, Christian education and worship shall always be a part of the total learning experience here at Kamehameha Schools. 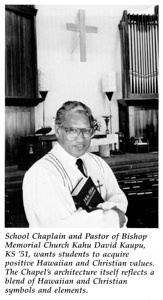 The present Chapel was dedicated in 1988, Kahu David Kaupu (KSʻ51) was the Chaplain of Kamehameha Schools at that time. Design by architects: Dwight Kauahikaua (KS ’70) and Dan Chun using Hawaiian religious traditions for the design of the Chapel building. 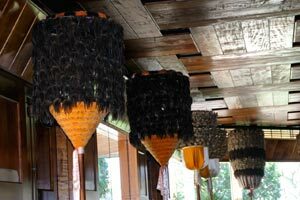 The theme of the Chapel is the ULU or the breadfruit. 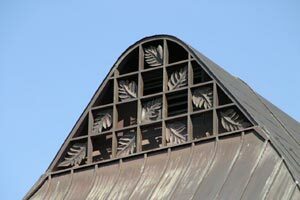 There are ulu trees growing outside in the courtyard as well as the ulu design incorporated throughout the Chapel. The ulu symbolizes abundant life due to the fact that the fruit grows abundantly. The lava rock foundation resembles a heiau or ancient Hawaiian place of worship, high roof and dominant roof lines are in the Hawaiian architectural traditions. 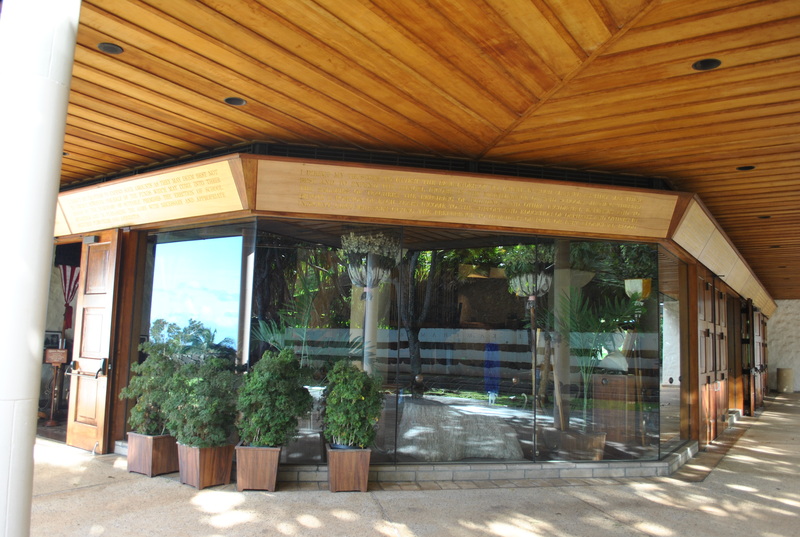 There is a koa frieze above the entry doors that spell out the 13th article of Mrs. Bishop’s Will creating and founding the schools. The interior of the Chapel is unadorned plaster reminiscent of the simple churches in old Hawaiʻi. The use of native Hawaiian woods, mostly koa, in construction of parts of the ceiling and trim and furniture. The cross is made of solid sandalwood or ʻiliahi. This lighter color wood used to be traded by the Hawaiians with traders headed east. In exchange for this wood, the Hawaiians would receive a nail. What does the nail have to do with the cross? The altar itself was carved and shaped out of solid coral. 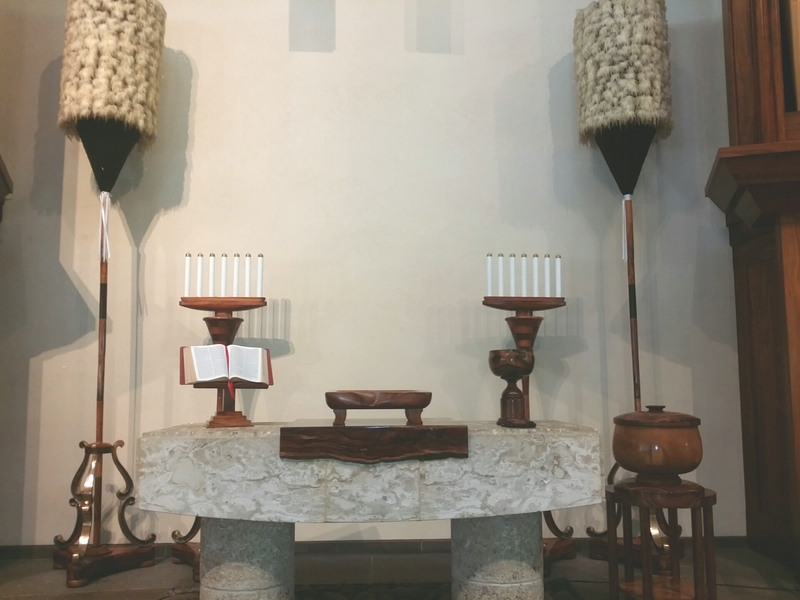 The rocks below the altar were hand picked by our KS Deputation Team of 1987-1988 from the two streams on the Kapālama campus. In the Old Testament, when an altar was constructed to God’s glory, the rocks were collected from the surrounding area and made into that altar. These rocks were collected from this ahupuaʻa. 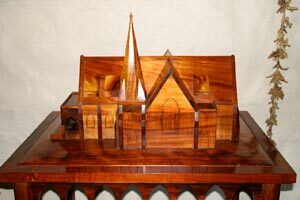 The pews throughout the Chapel are made out of solid koa that was brought from koa forests on lands owned by Kamehameha Schools. It seats about 500 people. 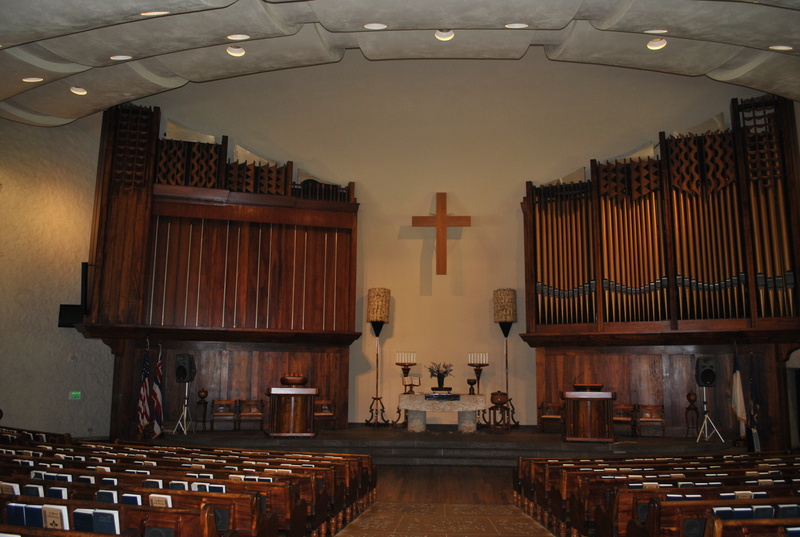 The Chapel pipe organ was built by J. Walker & Sons of London, England and has 3,200 pipes. There are 10 pairs of kahili, ancient symbols of Hawaiian royalty that adorn Chapel. 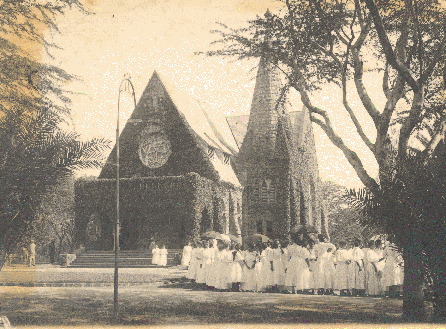 Two in the front recognize our school, two are within the royal pew for Pauahi and recognize her name (they look like flames and are from the name she was given after she was born for her aunt whom was rescued from a fire as an infant and was given the name Pauahi – pau-finish – ahi-fire), and 8 pairs recognize the 8 Hawaiian islands. The wood comes from that island and each kahili shows the color of the island as well as the height of each highest mountain. 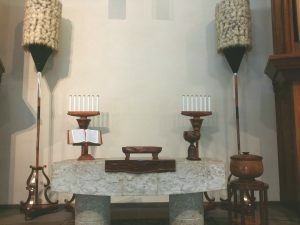 Inside the pew enclosure is a bench which belonged to Ke Aliʻi Pauahi and is a symbolic place of honor, much like the royal pews at the entrance of Kawaiahaʻo Church. The carvings above the organ pipes are designs taken from kapa beaters representing a heiau image, shark’s teeth, waves of the ocean, and a kahili design. The portraits in the back of the Sanctuary depict both Charles Reed Bishop and Bernice Pauahi Bishop. 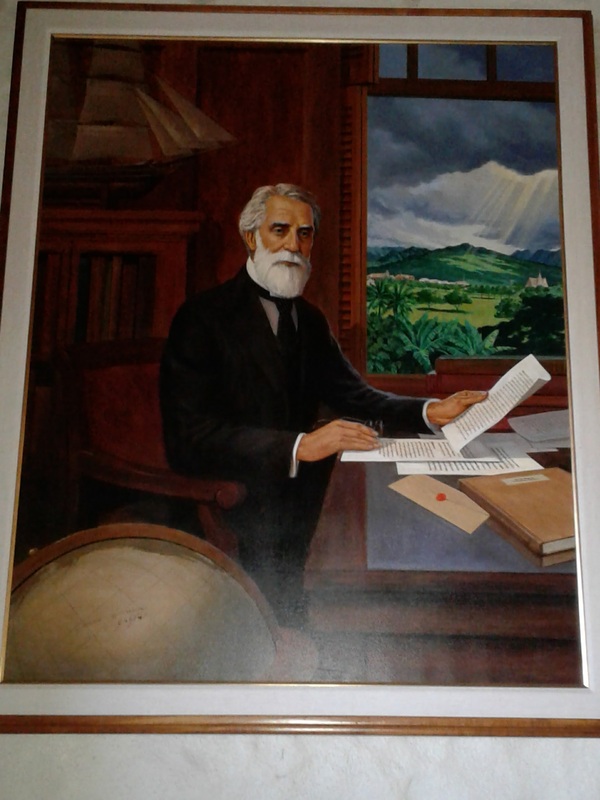 Mr. Bishop’s portrait show him writing letters and in the background is the Chapel and the original campus. In the far background is the sun highlighting the mountainside where the current campus and Chapel now reside. 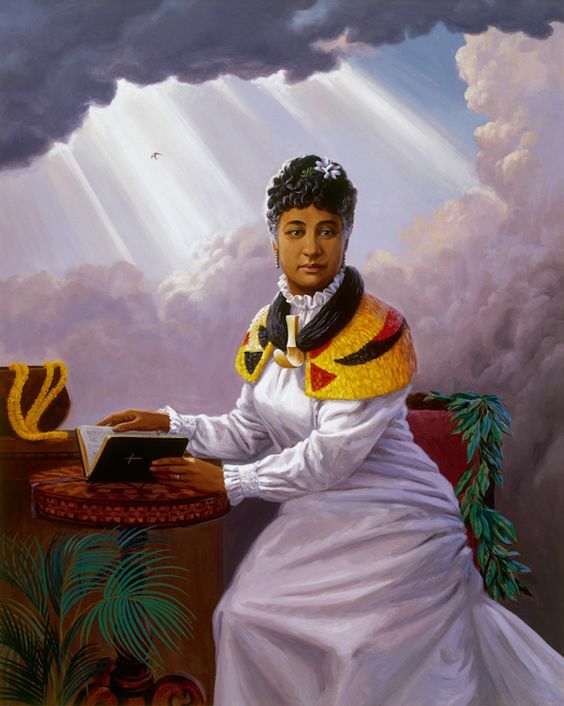 Mrs. Bishop’s portrait shows her wearing her palaoa and her cape and also holding her Bible. This shows whom we are at Kamehameha! A Christian and Hawaiian school! In the background are dark clouds and white clouds, symbolizing that we as Hawaiians came out of the dark into the light of Iesu Kristo. 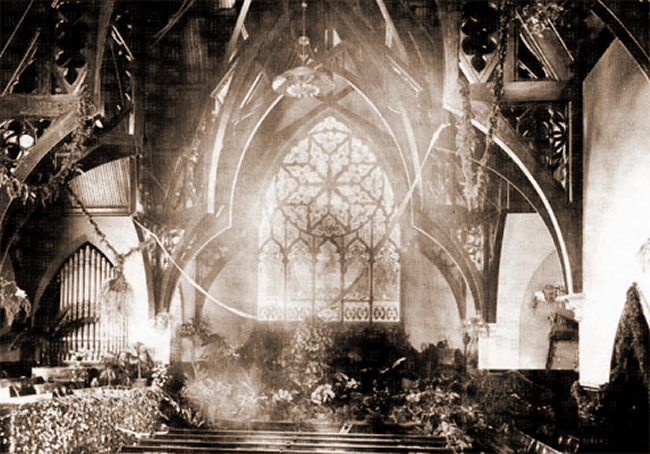 This translates into our architecture which has clouds above, with the Chapel’s lights shining out of the clouds.